While most of the guys in my dorm in college were playing Warcraft 2 and Half-Life, I was filling my free time with Worms Armageddon fire-fights. Whether it was a multiplayer tournament with my neighbors or a one-on-one battle with my soon-to-be-wife, Worms was always good for some intense strategy and lots of hearty laughs. After a stint in the 3D world, the Worms franchise is back to 2D Land and is almost as good as ever. It is still a solid effort from Team17 with some enhanced two-dimensional graphics, but reportedly, some of the weapons that Worms aficionados would come to expect (Holy Hand Grenade) are missing for some reason. This XBox Live release is probably good enough to warrant the reasonable price, but unfortunately, it’s not enough to make my wife want to buy an XBox 360. “Multiplayer was always going to be the most important part of the series and thankfully it’s pretty easy to setup an online or local game. Playing an offline local game with the team’s sat around a single Xbox just involves a hot seat affair with players taking turns to move their individual worm and if they desire, use a single special ability or fire a weapon. You can have a maximum of four teams with four worms so in theory matches involving 16 players sitting around a single Xbox are possible and in this rare instance highly recommended. Taking the time to rename the teams and individual worms is a must to garner the most fun from this title. Xbox Live games are even better suited as teams and players can be situated anywhere around the world. Private matches allow you to set up the equivalent of an offline local game with teams and players that you personally invite. The create, custom and quick matches are standard Xbox live fodder and allow you to fine tune your game exactly how you want. “Graphics are crisp and look great in HD, and the sounds are your typical silliness, with the voices making you laugh. 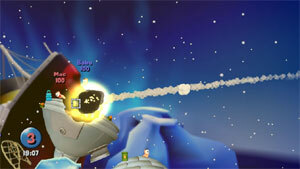 But with Microsoft lifting the limit on XBLA games just too late for Worms, the game suffers. There are only three backgrounds available which is a huge shame, and after around ten games you’ll feel the landscape is very similar too. It just doesn’t feel different enough. Similarly with the voice bank. There are six different voices, two of which are French and French 2. Not being French, I hear little difference. Again it’s disappointing, but you have to again look at the limit and wonder why it was ever in place. Not many games have suffered from it before, but Worms certainly has. The napalm from a barrel explosion isn’t in the Dreamcast version of Worms Armageddon (not sure if this is true of Worms World Party), and I never understood why. Honestly, some of the physics also felt as though they were a bit off in the version for Dreamcast. In fact, I couldn’t seem to use the Ninja Rope well at all. I, personally, could do without the overpowered weapons, although some of them (such as the Super Sheep) required legitimate skill. I’m pretty disappointed about the loss of the Baseball Bat (Yet the Prod is in. Why, oh why? ), but I’m even more puzzled as to why they dropped the Pneumatic Drill in favor of the Jetpack. 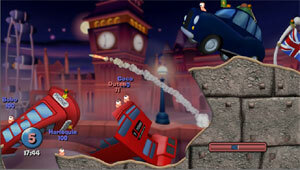 By the way, the headline should read, “Worms Blasts Its Way onto Xbox Live Arcade.” There’s no apostrophe. I was reading some other reviews, and – apparently – the behavior of the Ninja Rope in the XBLA version has been tweaked so that it’s much more difficult to exploit it in order to vault over obstacles. In my opinion, the Ninja Rope was so awesome because of how it could be exploited. …Wait. The original Warcraft came out 5 years before the original Half-Life and Worms Armageddon. You mean Warcraft 3, right? My freshman year my roommates were obsessed with WarCraft but it was a few years old then. Half-Life was popular my Junior year. oop — I just doublechecked the box art and it was Warcraft II. Sorta of unrelated but whatever: It’s about time MS lifted that stupid 50Mb size limit on XBLA games, that limit was so stupid it’s not even funny, hopefully now we’ll start to see more XBLA games and a bigger HD (and a decent 2D gamepad while we are at it). I’ll admit it, I never played Worms…ever. Mainly because I don’t like Strategy games. I’ve just played the demo on the Xbox360, I do have to say that why did I miss out on this game. Maybe eventually I’ll buy it.